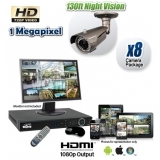 Stand Alone Security Systems in HD and Beyond! CCTV Camera World takes pride in offering professional quality security camera systems for the home or business, backed by US based expert technical support. We have extensive knowledge of the equipment we sell, which enables us to provide fast and effective support. Our primary objective is to match each customer to a system that will work for their needs. For most home and small business use, our pre-packaged surveillance systems listed below will suffice. For projects requiring different camera types for each mounting location, we suggest building the system a la carte or by using our Custom Security Camera System page. Regardless of the route you take, our security camera systems are easy to install, and user friendly. Standard features of all of our systems include motion activated recording, remote access via the Internet, indoor and outdoor cameras, and infrared night vision to see in complete darkness. At the heart of each system is a professional Digital Video Recorder (DVR) or Network Video Recorder (NVR) that can store days, weeks, or even months of security footage. CCTV Camera World is proud to offer standalone camera systems available in Analog, HD Over Coax, and Digital IP signal types. Depending on whether you are upgrading from an existing system, or installing a video security system for the first time, read below to learn How to choose the right security camera system. HDCVI video technology supports video resolution up to 4K to be sent over a coax cable up to 1600ft. HDCVI is a great choice for installations where there is existing coax cabling in place from older CCTV systems, or where long cable runs are required. HDCVI cameras also tend to be less expensive and are simpler to install and maintain in large scale surveillance systems. Also known as network cameras or PoE cameras, IP based cameras are available in resolutions even higher than 4K Ultra HD. IP cameras use network cabling to transmit video as a data signal that can be sent directly to a PoE NVR or over a computer network. Network based cameras are recommended for new installations as they offer cutting edge technology and customization of video quality from each camera by logging in to its web server. To learn more about how to choose the right security camera system, please watch the video below. At CCTV Camera World we strive to provide excellent and expedient technical support. To enable easy setup and operation of security systems purchased from us, we have developed the guide below so that all pertinent information is available in one page with easy to follow video tutorials. For questions about specific functions not found here, please be sure to visit our DVR and NVR help knowledgebase. How To Setup a Security Camera System? The first phase in setup of a surveillance camera system consists of installing the cameras and running the wire. The second phase is completing the connections between the cameras and the recorder, which depends on the type of camera system you have purchased. NVR camera systems use plug-and-play IP Cameras that connect directly to built-in PoE ports on the back of the NVR. Such systems are also commonly referred to as PoE IP camera systems because the cameras use Power over Ethernet technology to send power/video/data all over one network cable. We recommend using CAT5e cable as a minimum, and CAT6 wire is recommended for runs longer than 150ft as its thicker wire gauge allows for improved power transmission. Our IP camera systems feature plug-and-play compatibility between the NVR and IP camera. 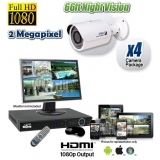 Unless otherwise specified, we ensure the cameras and NVR we sell are compatible with each other and allow even a novice user to setup a IP security camera system. To gain a good understanding of your purchase, we recommend customers bench test IP cameras with the NVR recorder before installing the cameras. Once it is established that all cameras are operational, continue with mounting the cameras at the desired location and running the camera wire. Since installation errors are common when crimping CAT5e or CAT6 network cable, we recommend using a cable continuity tester to safeguard against wiring related issues. As each camera is installed and connected to its wire, follow the video below to learn how to connect each IP camera to the NVR in a NVR camera system. Before you are able to login to your camera system over the web, you need to login at the DVR or NVR itself using a mouse. Connect the recorder to a monitor that supports at least 1080P resolution. We recommend using a HDMI input capable monitor. Turn on the recorder and login using two possible login methods. When logging in at the recorder, most of our surveillance video recorders allow quick access using a graphical pattern as a password. You can also login using the username and password stated on the sticker located on the top of the unit. Please watch the video below to learn more from our video tutorial about the two different ways to login to your or security system. In case you are unable to login due to a forgotten password, it is easy and secure to reset the password and gain entry into the unit. It is required that you be present at the recorder when following the video guide below on how to reset the login password. As shown in the video below, by answering some simple security questions you can quickly reset the login password. It is important to understand the difference between digital zoom and optical zoom, and the fact that optical zoom can only be used in live view mode. Below is a detailed video demonstration of each type of zoom function and how both can be utilized during live view to see objects far away. Using a 4MP security camera mounted 7ft above the object of interest, we show the power of optical zoom provided by a motorized zoom security camera to view objects in fine detail. If your system has motorized zoom cameras or Pan Tilt Zoom Cameras that you purchased from CCTV Camera World, they can be easily controlled using our surveillance video recorders. Regardless of whether the motorized cameras are HDCVI or IP cameras, or whether your recorder is a DVR, XVR, or NVR, the cameras can be controlled using the friendly GUI interface of our systems as shown in the following video. A common misconception about our camera systems is that all cameras have to be the same resolution, which is not the case. Cameras of different resolutions can be used on the same recorder in any of our systems, granted the cameras are within the maximum resolution limit of the recorder. This is true for systems consisting of Tribrid DVR, XVR, or NVR recorders. Main Stream - high resolution video stream that can be a maximum value equal to the resolution of the camera’s sensor, or a lower value selected by the user if bandwidth is being conserved. Sub Stream - a lower resolution stream used when viewing multiple cameras in a grid on the computer or mobile device. The Encoding menu has several settings that can be set. A good understanding of the following settings is important in getting the most out of our security camera system purchase from CCTV Camera World. Codec - is the video encoding compression method used. It can be H.265 or H.264 depending on the model of the camera and recorder. H.265 video encoding provides up to 50% bandwidth savings over H.264. To use H.265, both the camera and surveillance recorder have to support H.265. Resolution - is the size of the picture in pixels. When comparing video at the same angle of view (zoom length), higher resolution video provides facial detail farther away when using digital zoom for magnification. The resolution option available in this section depends on the camera resolution and whether it is compatible with the DVR or NVR. For example, a 12MP IP camera is not compatible with a 4K NVR that supports a maximum of 8MP. You would have to set the camera to 8MP or 4K resolution to use it with a 8MP 4K NVR. Likewise, a 4MP HDCVI camera is not compatible with a 1080P DVR unless the camera can be set to 1080P using a 4MP HDCVI DVR. Frame Rate - allows for adjusting how many frames per second (fps) are recorded from your camera. It also depends on the capabilities of the camera and DVR. 30fps is Real Time video without any frame skipping. To conserve hard drive space 1080P and higher resolution cameras are commonly recorded at 15fps. You would use 30fps only for quick motion applications like license plate capture cameras or for cameras overlooking a cash register. Here is a quick video demonstrating the differences between video filmed at FPS settings of 30 thru 3fps. Bitrate - is the amount of data per second that is saved for each security camera. Having a low bitrate would cause the video to be very pixelated as the video is compressed more. For example, attempting to save H.264 encoded 4MP resolution video of 20fps at 2mbps would cause the video to be pixelated and seem of poor quality. A bit rate that is too high would have diminishing returns as it wouldn’t improve video quality beyond a certain point. We recommend first selecting the codec, resolution, and frame rate; our digital video recorders will recommend a bit rate based on the selected settings. As a guide, use the below bitrate settings for optimal video recording if hard drive space is of ample capacity in your system. The in-depth video tutorial below discusses encoding settings available in your system and how to configure them. We manufacture our cameras to produce the best possible picture quality automatically. Sometimes peculiar lighting scenarios in a scene may require customization. Our DVRs and NVRs allow multiple picture quality settings to be modified from the recorder as explained in the detailed video tutorial below. It is important to note that there is a difference in capabilities to modify image settings when comparing coax based cameras versus IP cameras. Coax based cameras produce video that is encoded by the DVR, thus allowing picture quality to be modified before the video is saved by the DVR. In contrast, IP cameras encode video that is streamed to the NVR for saving the video stream; the video is not encoded by the NVR. Therefore, any changes made in the picture settings on the NVR must be communicated back to the IP security camera. If an incompatible IP camera is used with an NVR, such changes will not be communicated to the IP camera, and changes will not apply before video is encoded by the camera. Our systems allow a wide variety of picture settings to be toggled depending on the camera specifications. In addition to picture brightness and contrast, the user can toggle image quality features such as backlighting, glare compensation (WDR), and image flip. Motion Detection - when pixel changes in the video are detected, video will be recorded automatically. The user can set different sensitivity settings and specify certain areas of the picture as motion zones for each camera to reduce false positive motion events. The digital video recorders in our systems even allow multiple recording methods for each camera. For example, cameras can be set to record all the time or during a portion of the day using the scheduled recording method, while also recording upon motion detection. This preserves video integrity in case a motion event is missed, and is very helpful when reviewing recorded security footage to allow the user to skip to points in the timeline when motion is detected. The video tutorial below is an in-depth guide on how to set the different recording methods for each camera in your surveillance system. Select the month and day you would like to review footage from the calendar on the right hand side. The days highlighted in blue have recorded footage. Select the cameras you would like to playback recorded video from by clicking the select boxes. Select the point in the video timeline you would like to begin playback from. You can playback one camera or multiple cameras depending on the resolution of the recording and the playback capability of the recorder that is part of your system. Our 4000 series NVRs support playback of up to eight 1080P channels, while our 5000 series NVR support up to sixteen channel playback at 1080P. Stronger playback capability is available when playing video over the network using our free computer client software to playback video on a PC or Mac workstation. When there is an incident, it’s important to have a camera system that allows easy download of security footage catching the perpetrator in the act. Our security camera systems are based on this simple principle to allow easy video download to a USB drive and playback on a Windows or Mac computer. To download video from any of our standalone recorders you will need a USB flash drive that is formatted with the NTFS or FAT file system. Our video guide on how to download footage from your security camera system walks you through the process. Briefly, below is a list of simple steps on how to download video from a DVR Camera System or HD IP Camera System purchased from CCTV Camera World. Below is an outline of features that are standard in all of our security camera systems, regardless of whether it is a HD IP camera system or Security DVR system. Even our 2 camera systems come with the same standard features as our larger and more advanced systems. The difference between systems is the recording resolution, the camera type, lens and infrared night vision distance. If you are looking for a security camera system custom-built to your needs, then we suggest using one of our custom security system builders. Our outdoor security cameras have a weather rating of IP66. These cameras are unaffected by a range of weather conditions including rain, snow, sand, and temperature variances. When we say our cameras are IP66, we mean it. You can put them outside without any cover on a pole in the middle of nowhere, and they will withstand the brutality of mother nature, short of a hurricane or tornado. H.264 compression is a form of video compression that allows the DVR to capture video from the camera and store it on the hard drive inside. The H.264 codec greatly reduces the size of your digital video files without compromising video quality. Thanks to this video compression technology you can record great quality while maximizing hard drive space. Multiplex operation enables simultaneous user operations of the security camera DVR. You can view live video, playback recorded video on the DVR or remotely, back up video to a flash drive, without ever affecting the recording process on the DVR. Thanks to the strong processor in our DVR recorders, you can have up to 10 users login simultaneously in to the DVR and view/playback video without ever stopping the recording process. Remote view your surveillance system on your iPhone, iPad or Android device. Every system comes with a free app that allows you to view your cameras anywhere in the world as long as you have internet. Based on your security needs, you can choose from multiple recording settings on the DVR that comes with our systems. You can record continuously for 24 hours 7 days a week. You can select to record on a set schedule for specific days and times or upon motion detection where the system will record when it detects movement in view of any of the cameras. The motion detection feature of CCTV Camera World systems allows for setting motion detection zones where you can select areas in view of each of your cameras in which you would like to detect motion. The motion detected within those areas can trigger recording of that one camera or any other camera in your system. This motion detection feature allows you to save hard drive recording space so you can record longer than the stated time above, and only record instances where something is actually happening in view, thus saving you a lot of time when you go back to view recorded video. Motion activation also can be configured to send you motion alerts to your phone, email, or trigger the internal buzzer on the DVR. For areas with high traffic or of high importance such as casinos, schools or retail stores, in which constant monitoring is required, the system can continually record 24 hours per day, 7 days per week. With the auto-overwrite feature, there will never be a lapse in recording when the hard drive space is full. The video recording will automatically overwrite the oldest video first. You can set your DVR to record on a day/time schedule based on your needs. For instance, if you only want the cameras behind the cash register to record during business hours while the outdoor cameras can be scheduled to record when the business is closed. The schedule can be set for all cameras or specific cameras. If you can hook up your DVD player to your television, then you can install your own security camera system. To simplify the process, we have several YouTube videos that will teach you by example how to connect all the wires together and operate the friendly point & click interface of our security DVR recorders. The DVR is easy to operate thanks to the intuitive user interface and the included mouse, and hand-held remote control. Video and images can be easily backed up using the DVR's intuitive timeline by selecting a time frame to export to a USB flash drive. You can also remotely backup video to your computer over the internet using the included free software. For ease of use, all of our systems come with plug and play cables that carry both video and power from the DVR to the camera. There is no need to have a separate electrical socket located at each camera (unless where indicated). We also have bulk cable available so that you can cut specific cable lengths to your needs. You can purchase Siamese CCTV cable with connectors from the drop down menu above. Upon request, we can configure the DVR IP address according to your network settings. Just let us know what IP address, gateway and subnet you would like your system to be configured. By default, all DVRs ship out with auto-overwrite feature activated so that it will automatically recycle over the oldest video when it reaches capacity. There are no monthly charges, no binding contracts and no overage fees. Once you’ve installed your system, simply connect the DVR to your internet router or modem and you can view your cameras anywhere in the world at no additional charge. If you are not satisfied with your system, you can exchange it or receive a credit within 30 days of purchase. Your system also comes with technical support for the lifetime of the product.